Several months ago I applied to this show, thinking there was no way that I would be accepted. It was the first show that I applied to that asked for a statement of my qualifications. Uh, statement of qualifications? What does that even mean? Was I even qualified? Clearly I was out of my league. I pondered the question for awhile, writing and rewriting my statement, much as I had my college essays eons earlier. Finally I decided to apply to the show, which seemed like a huge reach to me. I mean, the worst that would happen was I would get rejected, right? So imagine my complete and utter shock when I received an e-mail in early June informing me that I had been accepted! As I have gone through my first year of applying to and exhibiting my jewelry, I have come realize that this year I have been reexperiencing some of the very same motions and feelings that I had applying to and going to college. The nerves and excitement of the application process, the fear that you won’t get in, writing personal statements, the waiting. Today I share with you how participating in craft shows has been like reliving the college application process all over again. 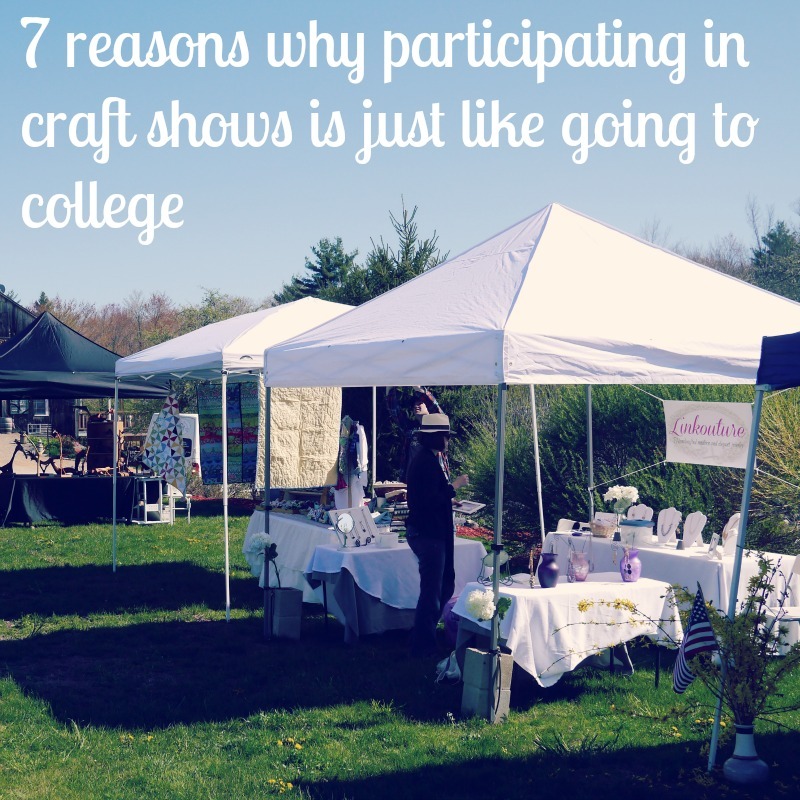 Just as every college is not for every student, so every craft show is not for every artisan. There are so many things to consider: location, fee to participate, size, clientele. Some are a good fit, and some are just flat out not. What makes you (or in this case, your product unique)? Why should you be accepted? With the competition high (especially, as I have found, as a jewelry artist) you have to try to stand out from the crowd while also showing why you would be a good fit. I remember anxiously waiting for the mailman to arrive in April of 2000 to see what would arrive in the mail for me that day. Would it be a little envelope or a big, fat package? Now, I experience those same feelings checking my e-mail to see if there is any news of the latest show. And you like college admission letters, you can tell from the first line whether or not you were accepted. 5. These things aint’s cheap! OK, so participating in a craft show is considerably cheaper than getting a college education, but it can still be a pretty significant financial investment that definitely puts a dent in your wallet. Get used to writing those checks! I remember driving off to my first day of freshman year, with everything I would possibly need for nine months, seemingly defying all laws of matter. How the hell did my parents manage to get it all in my mom’s minivan and somehow have room for my parents, sister and I to drive off to school? Similarly, it takes a small miracle and some amazing maneuvering skills on Sam’s end to get everything I need for a craft show (including a 10 foot by 10 foot tent, three folding tables, two chairs, four bins full of jewelry packaging and display materials, not to mention my jewelry) arranged in my little Volkaswagen Jetta and still leave room for us (barely). We are definitely going to have to rethink things for next year once there is a baby in the picture. Maybe it’s time to consider getting a bigger car? Ok, maybe this is just me because I’m a huge nerd, but I get nervous on the first day of a show if it’s the first time I’m doing it. I worry about getting lost, getting there late, setting up, figuring out the lay of the land, wondering if I will like my neighbors and if anyone will talk to me, and fearing that I am out of my league and somebody made a mistake. Seriously, it’s just like I’m a little freshman all over again feeling out of my element on the first day at college, but soon those anxious feelings melt away. Oh man, do I know what you mean. My husband is an artist/photographer and he’s done a lot of art shows/fairs/markets. We’ve only done a multi-day event twice, since we don’t really have the capital yet to pay for them. But the nerves! The expectations! And he is seriously a whiz at packing the car- sometimes I feel like I’m just in the way because he has a system that magically works in our tiny hatchback. By the way, that; super awesome that you got accepted for this event! Especially since you assumed you weren’t qualified 🙂 Thank you for visiting my blog! My husband tells me to stand out of the way when he packs up the car…I have no idea how he does it, but he somehow manages to squeeze everything in there! I guess it’s a competitive world out there so we need to market ourselves more and more!! Let us know how it went! Pretty awesome analogies and if I am in the Boston area over the weekend, I’d go! I’m in Cape Cod right now. What amazes me about the college process is that we did the whole thing without Internet. It existed already but I didn’t have it. No online info or emails to check. Just snail mail. You just reminded me how different it must be these days. And craft shows too, of course. Congratulations! 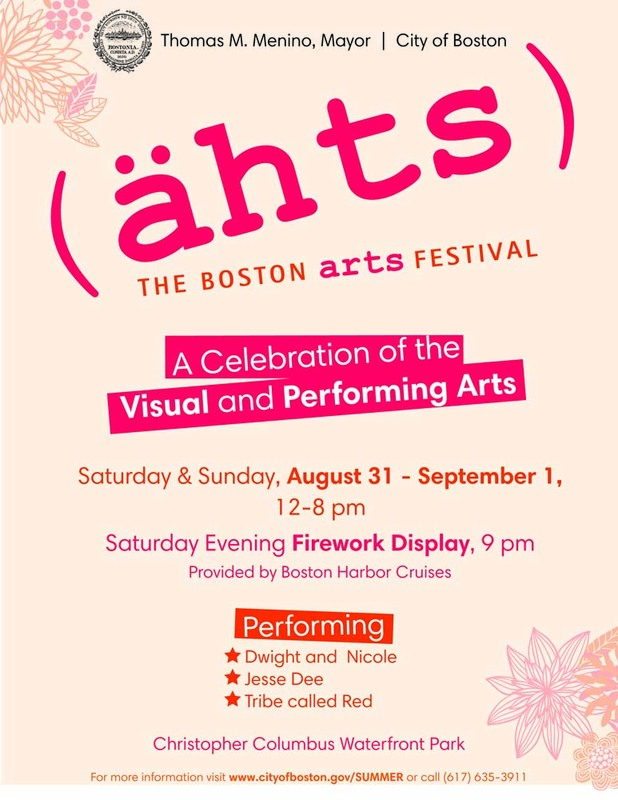 I love the sign for it (ahts)! They have a great craft show in Camden, Maine, right near the harbor every summer–have you been to that one–visited or displayed? I wish you good luck and good weather! Your pieces are beautiful–and so are you! It definitely is, and I think the competition has gotten a little stiffer in the Boston area recently (at least that’s the sense I have gotten from talking to fellow crafters). Hope you are having an incredible time on the Cape! I seriously don’t know how all these things happened before the days of internet. Everything I have found out about craft shows has been online. I mean, obviously people managed, but it’s hard to remember back to the dark ages 😉 Sometimes, though, I kinda miss normal mail…so much less stuff to read! Thanks, Ashley! It’s sad how often I check my e-mail, especially when I’m expecting something. Now I try to keep it closed to prevent me from getting so distracted! So that’s a bummer that I’m still showing up as a no-reply blogger (darn Google+). Had tried changing it yesterday, did it again, let’s hope it worked this time! I spent several years on the craft show circuit. What a ride! I loved all the eccentric people I met along the way and had a great time. It sounds like a lot of work…but a lot of fun! You make beautiful jewelry…they are lucky to have you! It definitely is a ride, it’s unlike anything I’ve ever done before. Still have yet to meet some eccentric folks, but I’m sure with time it will happen! Thanks, Michelle! It definitely is a lot of work, but I don’t know that it’s necessarily more than anything else I’ve done before, just different. Even though a lot is out of my hands, it is a lot of fun for the most part. It really sounds like the whole thing is a learning process. I can imagine how hard it is to fill out all those applications and wait to be excepted. I think how quickly you were able to move into.that world is testimony of your skill. Thanks, Carla 🙂 Thankfully it’s generally less work than filling out a college application, but the waiting is just as nerve-wracking (at least for me)!